Yemen, one of the oldest centers of civilization in the Arab World and also the poorest Arab country, has been pounded by airstrikes led by its rich neighbour Saudi Arabia for almost three months. The operation began after rebel group Houthis took over the capital Sana'a, causing President Abdu Rabu Mansour Hadi to flee to the port city of Aden and shortly after seek refuge in the Saudi capital, Riyadh. Over 2,500 people have been killed and 11,000 injured since the war started on March 25. One million people have been internally displaced in Yemen and 21.1 million — 80 per cent of the population — are in need of humanitarian assistance, according to the latest report  by the UN Office for the Coordination of Humanitarian Affairs (UNOCHA). Yet the country's residents have not been the only victim of this war. Yemen's heritage has also suffered. On May 9, Saudi jets targeted the Mosque of Imam al-Hadi in the city of Saada, a Houthi stronghold. The mosque is the third oldest in Yemen and was built 1,200 years ago. On May 24, two Saudi airstrikes targeted  the ancient Al-Shareef Citadel in the city of Bajel in Hodeida province. On June 4, Dar-al-Hajar (Rock Palace), perched atop a rock in Wadi Dhar, north of Sana'a built by Imam Mansur in 1786 AD, was reportedly targeted by Saudi airstrikes. On May 25, Dhamar's Regional Museum, hosting thousands of artifacts from the Himyarite civilisation, was completely destroyed by Saudi airstrikes. On June 1, the ancient Great Mareb Dam, described as “one of the grandest engineering marvels of the ancient world” and one of the most important ancient sites in Yemen dating back to the ancient Queen of Sheba, was damaged by Saudi airstrikes which hit the better-preserved northern sluice. The original dam was first built in the 8th century BC, in the city of Marib which was once the capital of the kingdom of Sheba (Saba). 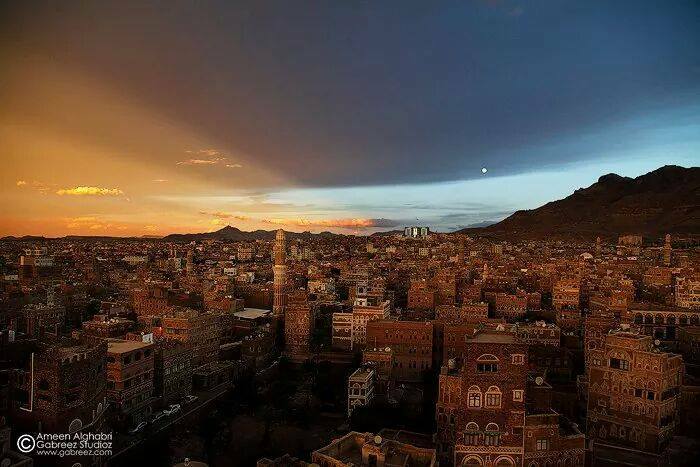 On June 5, the beautiful Al-Qahera (Cairo) Castle overlooking the city of Taiz was destroyed by Saudi airstrikes. Houthi and ousted president Ali Abdulla Saleh's forces were reportedly using it as a military position to shell their opponents in the city. Yemen Post News tweeted photographs of the castle as it was being hit and before and after photographs showing the damage. The destruction of all these heritage sites by Saudi airstrikes across Yemen seemed to go unnoticed until the morning of June 12, when a Saudi missile hit the Qassimi neighbourhood in Old Sana'a, listed as a UNESCO World Heritage site and boasting 9,000 mud houses, some of which are built before the 11th century. The world was outraged by the news of the destruction of this 3,000-year-old heritage by Saudi airstrikes, but mostly Yemenis were devastated. Ahmed Al-Sayaghi shared photographs of the Qassemi neighbourhood in Old Sana'a before and after the missile attack, showing the destroyed houses. Ali Almurtada drew a comparison to explain the feeling of Yemeni pain. Yemen perhaps is a poor country economically, but is very rich culturally  with its heritage and history, a source of pride to Yemenis and a painful loss to witness its destruction. It seems Saudi Arabia's “Operation Restoring Hope” has turned into “Operation Destroy History”. Today, Yemenis cry over human and stone, life and history, which are destroyed in the war by all parties, ousted president Saleh and Houthi forces and mostly the Saudi-led coalition.